New and significant growth on international markets for Grana Padano cheese. In 2018 it was confirmed as the most consumed PDO product in the world, for a total of 4,932,996 wheels. This according to data from the protection Consortium during its general assembly. Reaching a volume of 1,938,328 wheels, last years exports increased by 5.44%. Europe absorbs more than 82% of exports with a +4.5% compared to 2017. Germany confirms its position as the leading foreign market with a total of 494,768 wheels. In second place comes France, with 225,856 wheels, followed by Benelux (156,781). Production was divided as follows: 36.61% from industries and 63.39% from cooperatives. “The number of controls carried out in 2018 – said the president of the Consortium Nicola Cesare Baldrighi (in the picture above) – was equal to 224 inspections in the dairies, and the result we obtained is more than satisfactory. In fact, no situations of non-conformity emerged that would require a corrective action. Particularly intense is the vigilance inside the points of sale. The Consortium’s representatives visited 3,802 of them throughout the country, half of which were in Northern Italy and over 70% in hypermarkets, supermarkets and discounts. Over 2,968 controls were carried out abroad, focusing on counterfeiting and Italian sounding”. 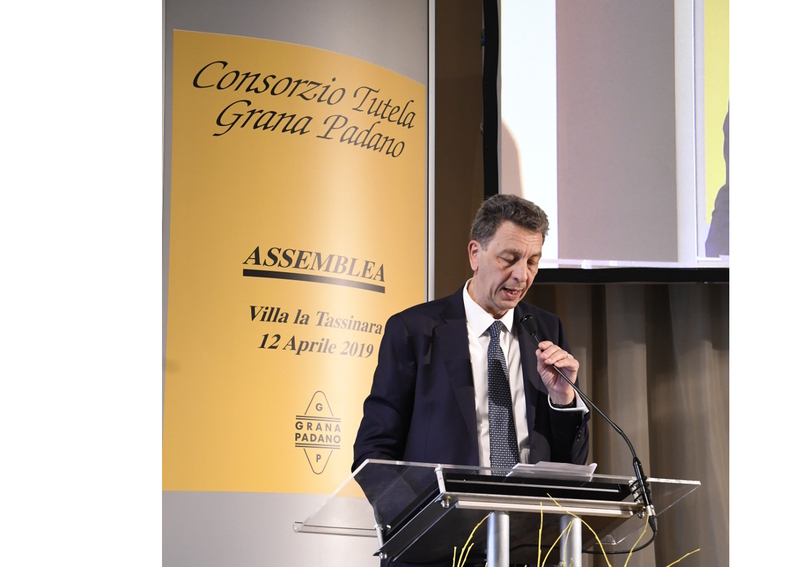 Looking to the future, president Baldrighi underlined that the Consortium is to “develop a new packaging format to give greater homogeneity and therefore distinctiveness to Grana Padano PDO. Moreover, two new categories will be introduced: 18 months and 24 months of seasoning, after the remarkable success of the Grana Padano Riserva in 2018 which grew by 30% in sales. This year the price differential with competing products will require further efforts not to lose market shares”.